We were thrilled to be a part of the West Egg Cafe’ renovation. This popular eatery and gathering spot on the Atlanta’s west side is a terrific place to get a smooth cup of joe and good, southern eats. Ben and Jen Johnson, proprietors, collaborated with Square Feet Studio to renovate the new West Egg space The design team kept it clean and cozy- using lots of subway tiles, school-house fixtures and furnishings with warm finishes. Drape98 was commissioned to provide grommet panels to help soften this crisp, commercial space. Our first charge was a large bank of windows on the west side of the cafe’ that provided wonderful natural light, but, in the afternoon, let in some blinding rays. The owners and design team wanted flexibility – let light in during the a.m. but offer some shade from the afternoon sun. 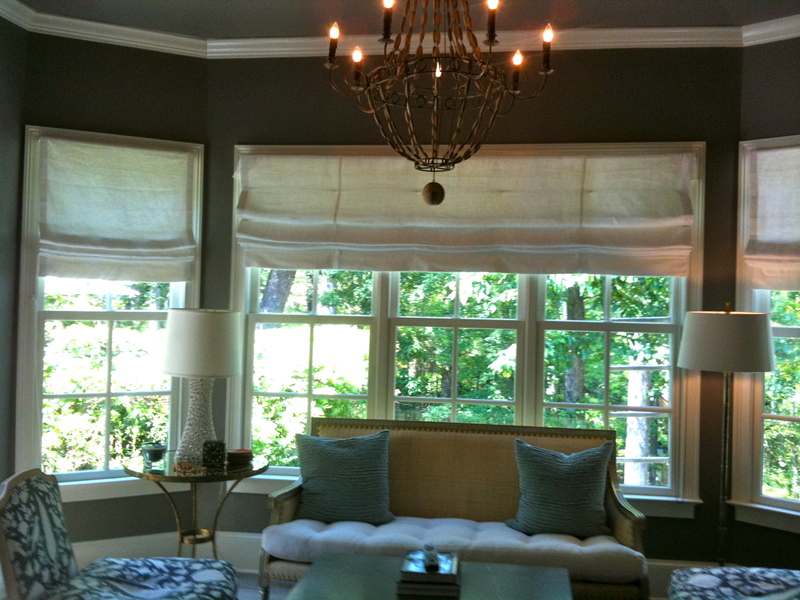 Drapes are always a great looking, affordable, functional option. 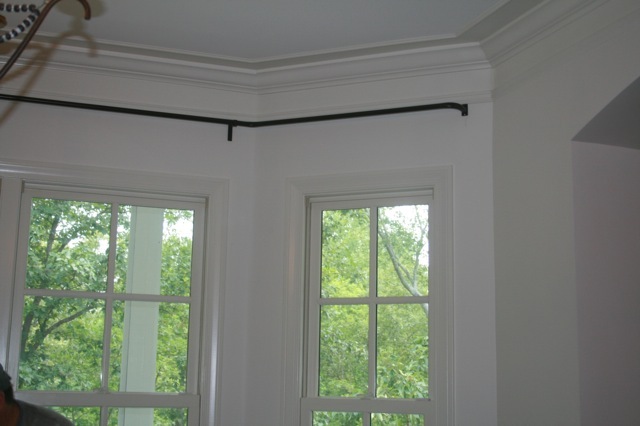 By adding wall to wall, bronze grommet panels that easily open and close (we minimized brackets needed by installing a 1 1/4″ diameter rod), the drapes dimmed the afternoon rays when shut and soften each dividing pane while open. The result is a wall of drapery that looks stunning both stacked and fully drawn. In addition to open dining area, Ben and Jen added a communal dining table near the entrance that could be used for group dining or meetings. The talented designers at Square Feet Studio, suggested we suspend grommet panels on either side of the communal area- providing and space definition. To stay consistent, we again used 1 1/4″ round, Drape98 Stock Iron Hardware, with partial ceiling and wall mount brackets ( part of the ceiling was a dropped soffet) and bronze grommeted panels made from durable, Khaki fabric. 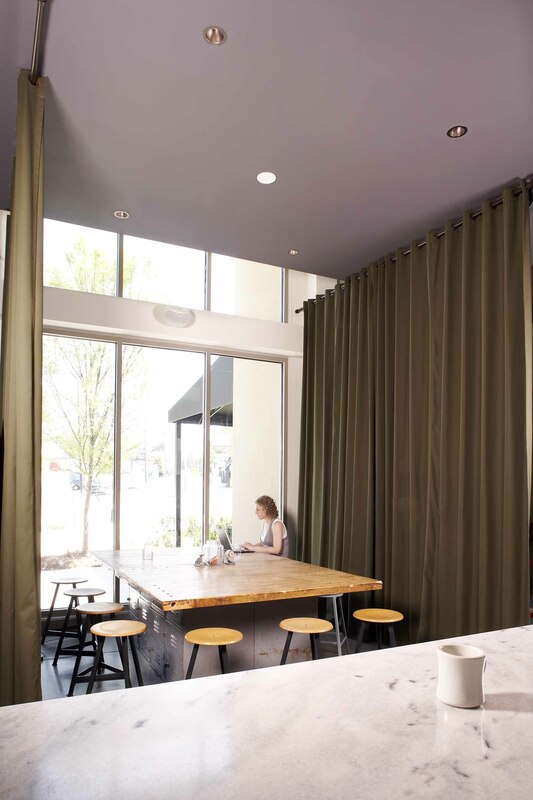 Upon entry, the new West Egg Cafe’ space is warm and inviting and we like to think that our drapery adds to the overall esthetic. In fact, we’ve had several calls from West Egg diners who want this look in their homes! In the area? Make sure to check out West Egg Cafe for a relaxed, urban diner experience all while consuming some darn good food. Check out their menu, location and hours at http://www.westeggcafe.com. 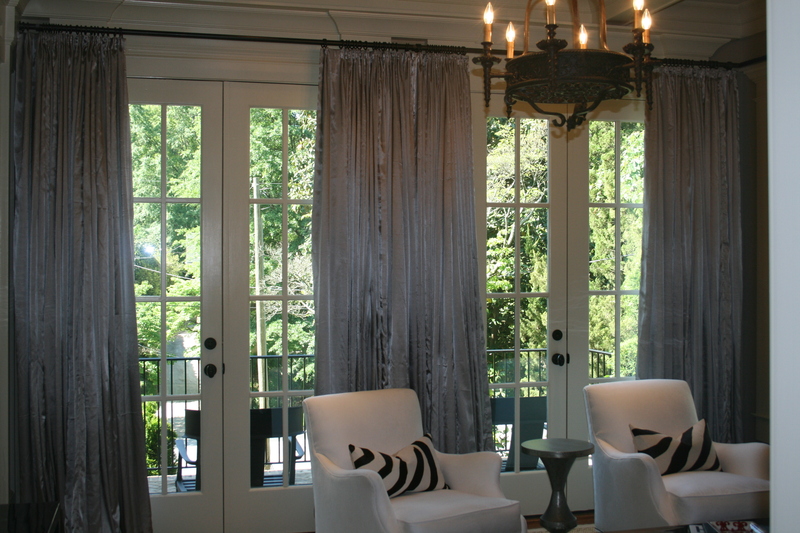 Drape98 recently created highly custom drapery panels for Vivian Bencich of Square Feet Studios in Atlanta. 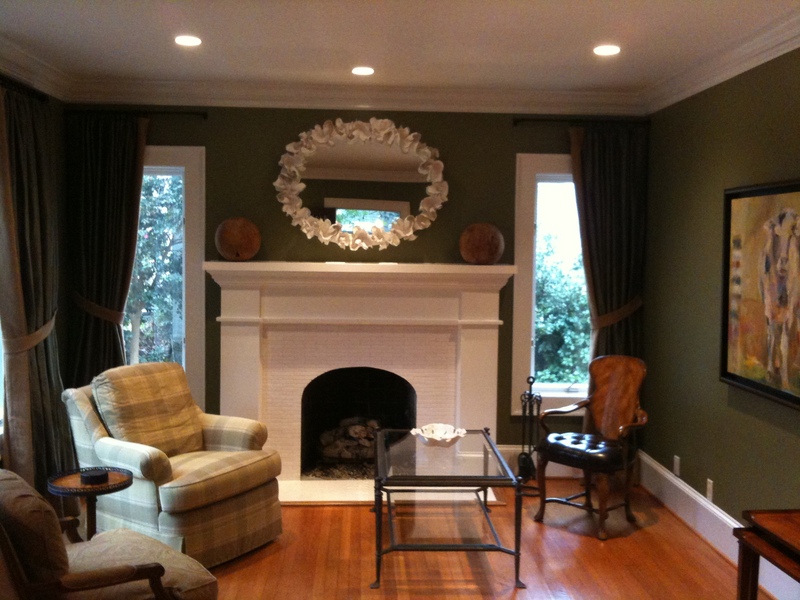 For this recently remodeled Atlanta bungalow, the homeowner specifically requested that Vivian use paint in a particular shade of green and wanted select family furniture to remain in every room while also adding new pieces to her collection. In order to maintain her clients requested color choices and incorporating already owned furniture pieces while still adding style and updated luxury, Vivian commissioned Drape98 to help with a drapery design that would bring luxury and high design, without overpowering the room. The panels must remain relaxed but still be beautiful. 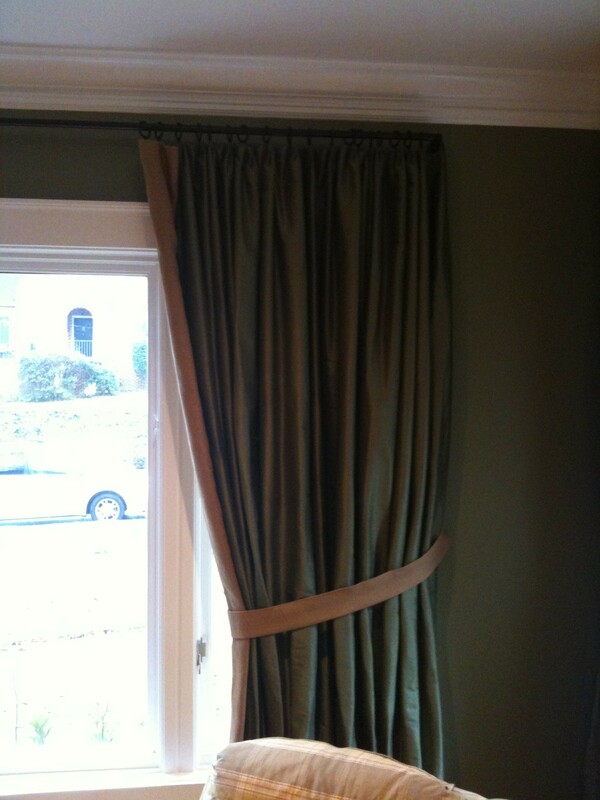 Vivian designed the panels to include a 9″ band at the bottom and leading edges of the drape. Soft europleats were fabricated in a “Dogwood” silk as the face fabric. By using silk as the face of these panels and then by asking Drape98 to interline, (we chose to work with a soft, flannel) the panels lent a luxurious warmth to the room. Finally, by adding a loose weave linen to the back of the panels, a comfort and ease is also created- incorporating all of what this homeowner and Vivian were trying to achieve. Vivian also wanted the panels to look as wonderful from the street looking in as they were while actually in the room. By using complimentary face fabric on both sides, she creates a rich softness that looks great from both outside and inside the home. Overall, Vivian successfully used high end, custom draperies that don’t overpower. Her interior design is accentuated by the panels which help define her space without detracting from the overall “look” of the room. Clearly the drapes play an important role while still remaining understated. Best of all, we understand that her client was thrilled with the result! a 9" Band, face fabric of silk, lined with a face fabric linen and custom tailored tiebacks in matching fabric. We’ve had an exciting couple of months at Drape98. We just celebrated our 2nd anniversary – and in this challenging economy we could’t be more proud of our little company. We also just completed two fabulous Idea Houses. The first is featured in this month’s Southern Living Magazine – the 2009 Southern Living Idea House at Tarpon Run in Port Aransas, Texas. 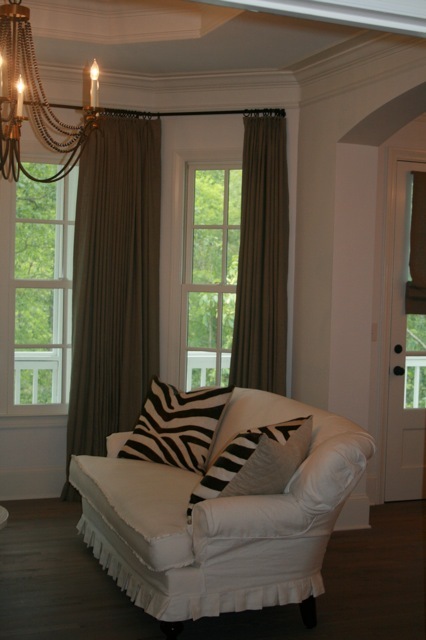 We were thrilled when Tracery Interiors asked us to fabricate all the drapes and provide all the hard ware (our custom D98 line) in this house. Paige Schnell and all the staff at Tracery did a wonderful job combining spicey yet tasteful colors and creating beautiful, comfortable and sophisticated interiors. Hats off to Dungan Nequette Architects for creating a spacious, liveable floorplan and design – perfect for today’s beach family. We also just completed the Designer Show House for the Arts in Alys Beach, Florida. Dale E. Trice of “Design” asked us to provide custom fabrication and our stock, custom hardware to help creat one heck of a dining room! 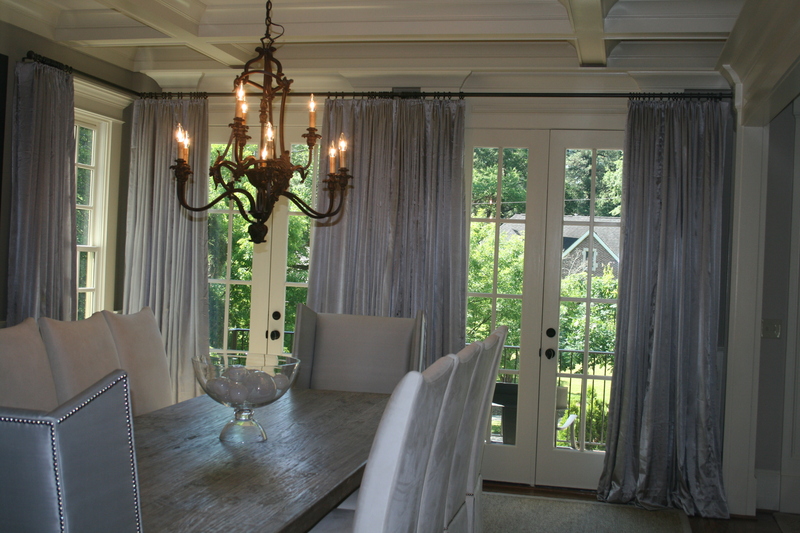 The drapes are a focal point as they both define and soften the space. What Dale creats is another stunning room that is formal and still inviting. When you visit, you really do want to sit down to dinner!